Merry Christmas [W5754] - $8.50 : Yarn Tree, Your wholesale source for cross stitch supplies. Cross stitch pattern by Country Cottage Needleworks. The smell of a fresh-cut Christmas tree, as you bring it inside your home to be decorated with ornaments. The fireplace keeping you warm as you wrap your Christmas gifts to be placed underneath the tree. A warm cup of hot cocoa as you sit down to watch the "Christmas Story." 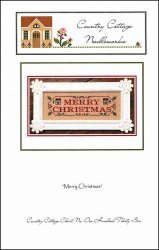 Enjoy thinking of all things Christmas, when you stitch this design. Stitch count 180w x 53h.